In today’s talk, Eli Beer shares an incredible story of how he, as a frustrated 17-year-old ambulance volunteer, Eli Beer: The fastest ambulance? A motorcycle was sick of sitting in traffic and getting to patients too late to save them. And so he organized a group of 15 fellow EMTs to respond to calls in their neighborhood, on foot if needed, and provide stopgap care until an ambulance could arrive. Over the past 25 years, this group — United Hatzalah — has grown to more than 2,000 volunteers. Last year in Israel, they assisted 207,000 people in need of care — 42,000 of them in life-threatening situations. 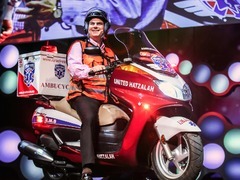 In this short Q&A on the TEDMED stage, session host Jay Walker asks Eli Beer some questions, including: How long did it take to change ambulance corps from foes to friends of United Hatzalah? What kind of training do United Hatzalah EMTs need? And is the service coming to the United States soon? Hi, how can we get hold of Eli? We have EMT’s on motor cycles here in South Africa but due to low government budget there seem to not be many. I would love to know Eli’s thoughts on how we could maybe start his program for ordinary citizens who are trained in first aid? The idea being that these ordinary folk can volunteer to be contacted if an emergency is close to them till an EMT arrives. This will save so many lives here as ambulances often arrive too late, especially in our poorer areas. This ranks right up there with the EMS golf carts introduced at the 1996 Atlanta Olympics. Just an FYI: Sydney Australia has had professional EMTs on motorcycles for quite a while to solve the exact same traffic issues.